Any business providing food to the public should be able to achieve a good food hygiene rating if an appropriate amount of time is spent considering the constituent factors. 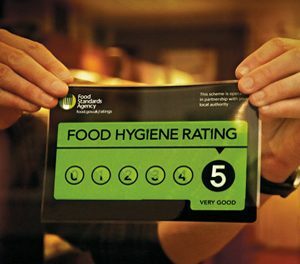 To achieve a good rating, you need to demonstrate to a visiting environmental Health Officer that you have achieved a good level of compliance with the legal requirements for food safety. How does the EHO assess this ? a. High standards of personal hygiene are in place for all food handlers. – eg clean over clothing (such as aprons), appropriate headwear, minimal jewellery and regular and appropriate hand-washing. b. Appropriate control measures are in place to prevent cross contamination – for example, the use of separate areas and/or equipment for handling raw and cooked foods and the effective use of colour coded chopping boards, and also the correct use of appropriate cleaning chemicals. c. provide evidence that all food handlers are supervised and instructed and/or trained in food hygiene matters in order that they produce food that is safe to eat. The Level 2 Award in Food Safety certificate demonstrates that food handlers have received an acceptable level of training in safe food handling techniques.